Don’t be fooled by the lookalikes! This is a 100% stainless steel multi-tool that comes with a carry pouch that has a belt loop and a carabiner and split-ring key holder. This 14 function tool includes a super bright LED flashlight powered by 4 SG1 button cell batteries that are included and inserted. 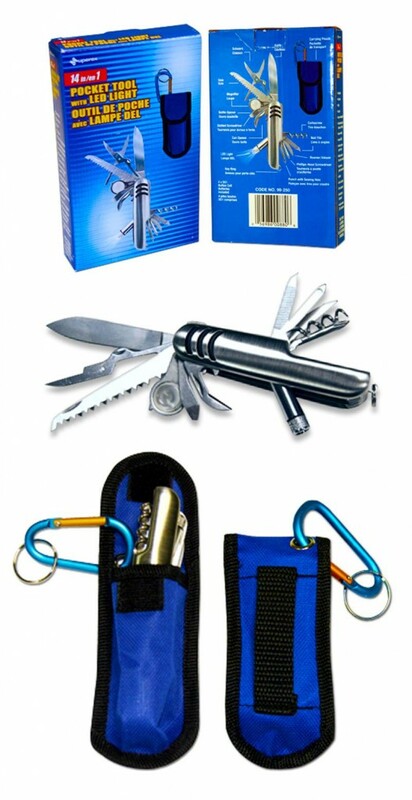 Tools include: cutting blade, scissor, saw, magnifier, bottle opener, standard screwdriver, can opener, LED flashlight, key ring, punch with sewing hole, Phillips screwdriver, reamer, file, corkscrew. Normally 9.99 ea, on sale for 5.00 ea. Multi tool is 3- 5/8″l closed x 1″ x 1″, imprint area is 3/4″ x 3/8″ near the cork screw. 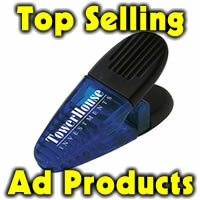 Price includes one location laser engraving (produces a subtle silver permanent imprint). Set up is 37.50. These will be popular so order now. Item ##99250.